With the festive season almost here, it’s time to think about treating family, friends and colleagues to delicious and gorgeous looking presents. 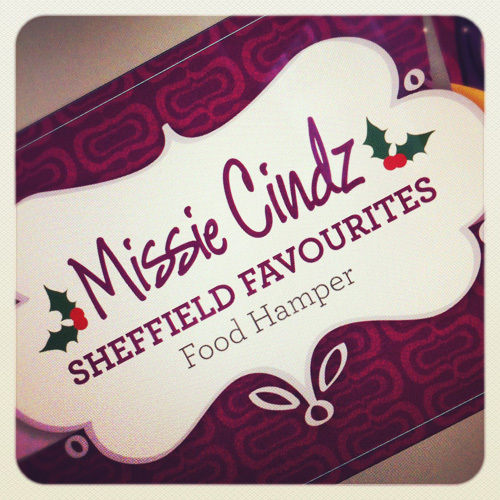 Make your Christmas gifts extra special this year and buy something delicious from your OWN city with a Missie Cindz “˜Sheffield Favourites”™ food hamper. My ‘Sheffield Favourites’ hamper is my concept to help showcase ‘a flavour’ of the huge number of talented food producers we have in the city, in an imaginative manner and in the Missie Cindz whimsical signature with, of course, to give pleasure to the hamper recipient’s taste buds. As a true Sheffielder (with a strong northern accent), I am very proud of the produce that this City has to offer. The City itself contains food producers abound who have developed very innovative ways of taking core ingredients such as bees, milk, pork and the right weather and making them into something individual. I will be unveiling my Sheffield Favourites Hamper at PJ taste’s ‘Taste of Christmas’ evening on the 24th November which aims to start a process of enjoyable expectation for the fast arriving festive season with an opportunity to taste the demonstrated dishes on offer and buy food Christmas gifts – it is shaping up to be a great night! Part of the approach to sourcing the produce on offer in the hampers has been to pick items that use as much locally sourced ingredients as possible to ensure that the produce is as SheffieLicious as possible. I can assure you that I have been undertaking a lot of quality control to ensure that what you receive is of excellent quality. Additionally, the job of choosing the produce to go in the hampers took a lot of debating – trust me (it was really difficult), there was a lot to choose from! 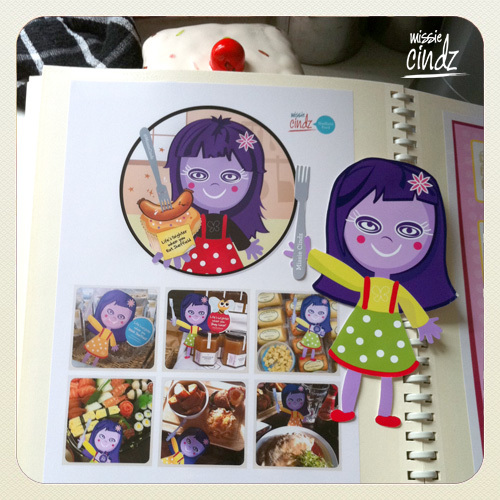 Missie Cindz Sheffield Food Album - please help to make this grow bigger! As a society, we are constantly being encouraged to source the basic ingredients locally – adopting a ‘grow local, buy local’ approach and hopefully my hampers will help to highlight the importance of Sheffield’s tasteful food scene – introducing to you a taste of the food range and producers we have available right on our door step. The journey of Missie Cindz started in March this year, after a visit to the Sheffield Farmers”™ Markets, where I was amazed by the sheer amount of wholesome Sheffield produce available and saw how food was able to bring communities together. I began meeting and found a bundle of many small independent businesses, like many others, were trying to find ways to save money while still advertising their amazing shops and business services – Missie Cindz came about to help let everyone know about their existence – and who genuinely enjoys promoting and shouting about independent and artisan food, especially in Sheffield. I have put a lot of hard work in to my campaign and the Missie Cindz ethos – where I’m curating exciting public engaging events and projects to really try moving The Sheffield Food campaign forward. My food-related rambling, obsessively taking pictures of what I”™ve eaten and blogging about all things food is not only a hobby, but has now become integrated in my daily routines. I hope the food producers, farmers and businesses I have had the opportunity to liaise with this year have appreciated my food adventuring efforts and will show support in these exciting food hampers launching next week. 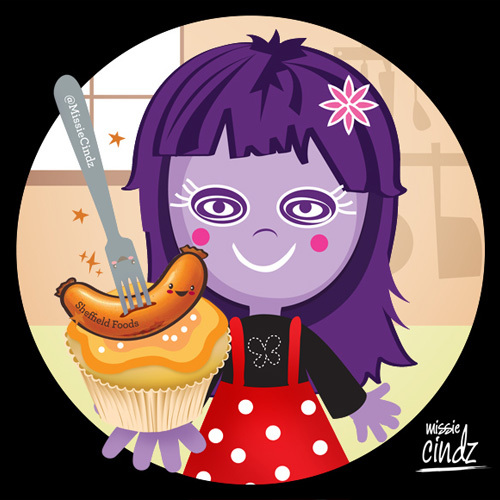 Missie Cindz doesn't half get around as I take her out with me whenever I'm out visiting food producers or eating out in Sheffield. Some of you won’t realise how some events I’ve curated can take months of planning and research of local food producers and growers – as seen in my Eat Sheffield Food For A Week Challenge (July 2011), which saw me visiting my local farmer”™s markets more than twice a month. It took a lot of perseverance (and smiles) to develop a strong understanding relationships between farmers and other local eaters but I realised that this journey was more than just eating local (Sheffield) food and I wanted to prove I could! With the popular Missie Cindz Pudding Club events, Missie Cindz Vintage Preserves marking Missie/Cindy”™s first foray into the foods retail industry working in partnership with one of Sheffield’s renowned food producer, PJ taste, and along with endless arrays of food challenges, blogging and tweets I do – it has been a very stimulating, tasty and learning process delivering my campaign’s ethos. A beautiful box full of Cindz favourite local goodies, all made and produced in Sheffield are available at all PJ taste stockists from 25th November 2011, priced Â£22.95. Orders can be reserved now and ready to collect nearer to Christmas by emailing to feedme@missiecindz.com (more hampers details will be provided), a Â£5.00 deposit confirms your order. 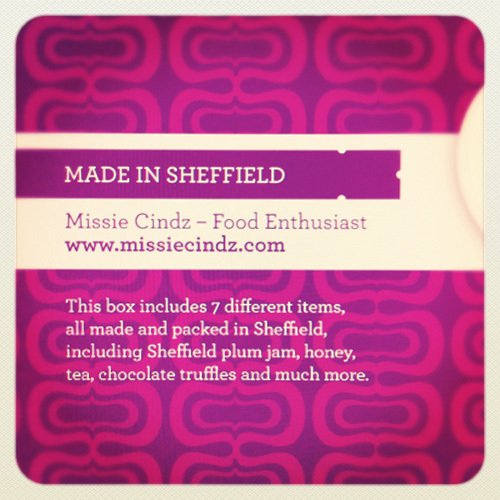 Finally, when you purchase a Missie Cindz hamper box, I hope that it exceeds your expectations and your experience of purchasing Sheffield produce in this way is more than a pleasant one – for a true ‘teaser’Â taste of Sheffield’s many award winning producers.